The first substantial grant made by NORAH allowed the Norfolk Record Office to buy a lot of documents at the Morningthorpe Manor House Sale in September 2016. This included a number of documents relating to elections in Great Yarmouth and Norwich during the early nineteenth century. Great Yarmouth political squibs are a fantastic resource for anyone interested in the the history of politics in that town. Squibs are pieces of satirical writings. They are effectively early party political publications. Political squibs can be surprisingly forthright in their approach. They show that the adversarial nature of political activity is nothing new. A number of these documents from Great Yarmouth are discussed in this blog. Many more are available for viewing at the Norfolk Record Office. The two MPs in Great Yarmouth in the 1820s and early 1830s were George Anson and Charles Rumbold. Both men represented the Whig party, which was also known as the blues. This helps explain the reference to ‘The Blue Interest being dreadfully depressed, the Shop will close in a few days’ in the image above. The jibe of ‘Russell’s purge to cure your ills‘ related to the new Whig leader John Russell, who later became Prime Minister in 1846. 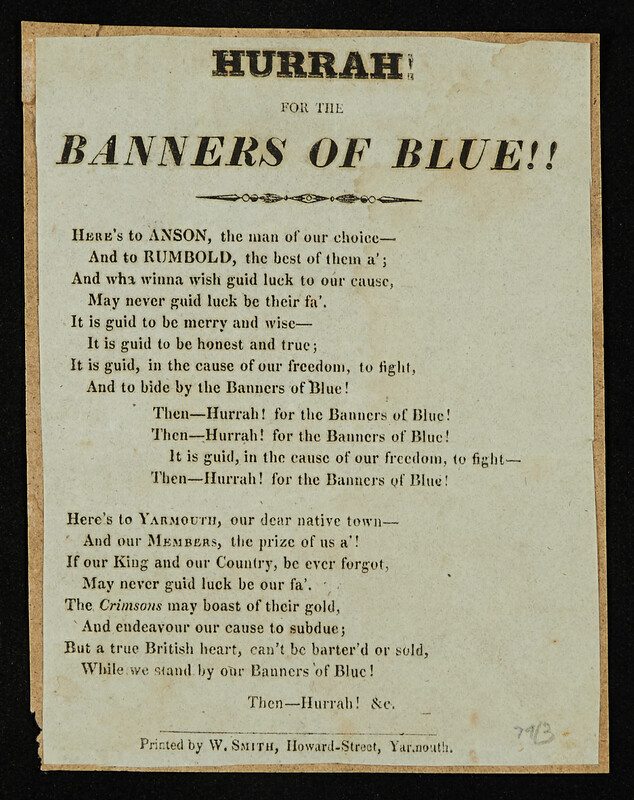 The next document relates to the 1830 General Election, when Henry Preston and Thomas Edmund Campbell stood against Anson and Rumbold. The two, who represented the Tories, had hopes of winning the constituency, but failed to garner enough support. In the election, Anson polled 946 votes, Rumbold polled 945 votes, Campbell polled 754 votes and Preston 751 votes. At the time there were only 1,700 registered voters in Great Yarmouth, despite the population being over 20,000. Elections at this time were anything but cheap for the candidates. The Essex Herald noted in August 1830, that the four candidates between them had spent around £28,000 on the campaign. In very approximate terms this represents a spending of around £1.3 million in today’s money on just one election. The expenses of these campaigns was becoming a growing concern. This was partly because of the cost of treating and bribing electors in the days before secret ballots. 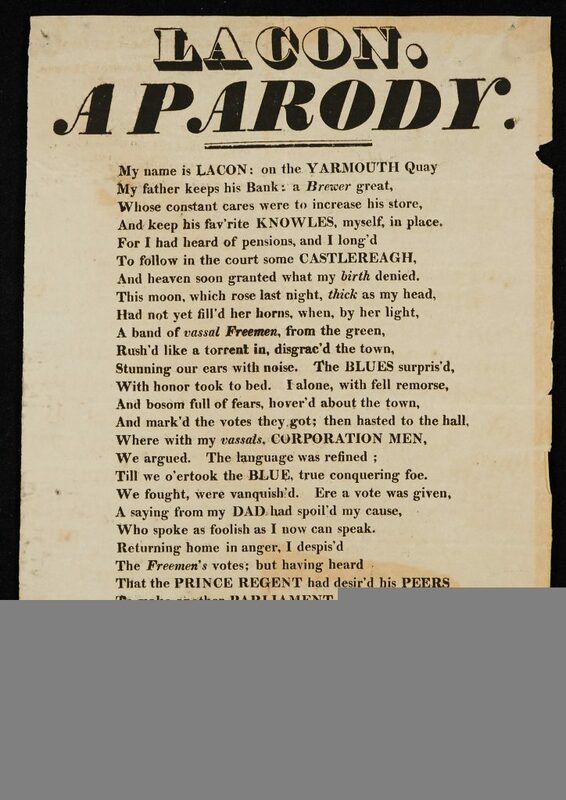 Also relating to the 1830 General Election in Great Yarmouth, this document particularly relates to Thomas Campbell, the unsuccessful Tory candidate. Campbell mentions his military experience, as he was at the time a lieutenant in the Dragoon Guards, and he wasn’t afraid to comment on the appearance of George Anson. 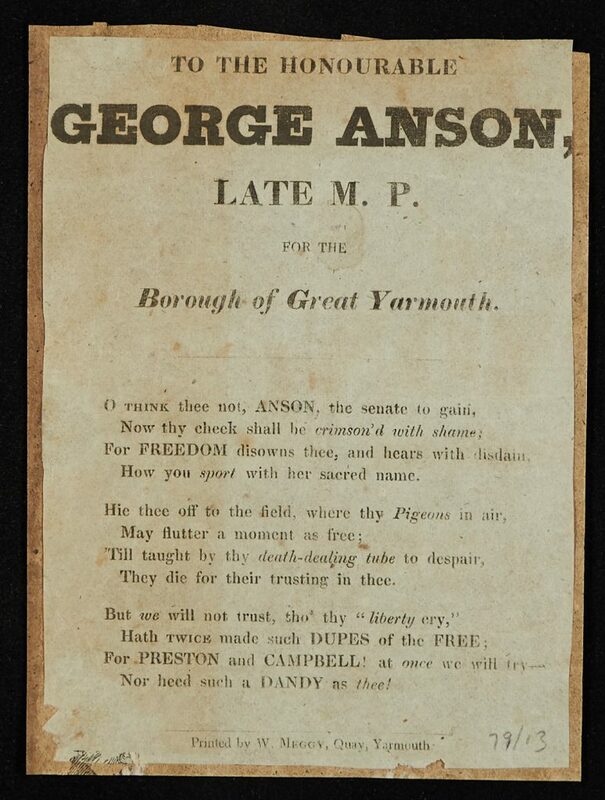 He, or the supporter who wrote the text, also refers to Anson as ‘George in the Dumps’. Campbell never did win a Parliamentary seat, although he was able to purchase his way into becoming a captain in the army in 1832. Simon Cobb was a local business owner and freeman who supported the reds, or Tories, and this document is an attack on the two Whig MPs. The names of the Anson and Rumbold were only partly printed, but it didn’t take much initiative to ascertain to whom G_____e A___n referred to and at some stage they were penned onto the document in hand. Cobb supported measures to reform the electoral system, which partly took place at the 1832 Great Reform Act, and to lower the level of taxation. 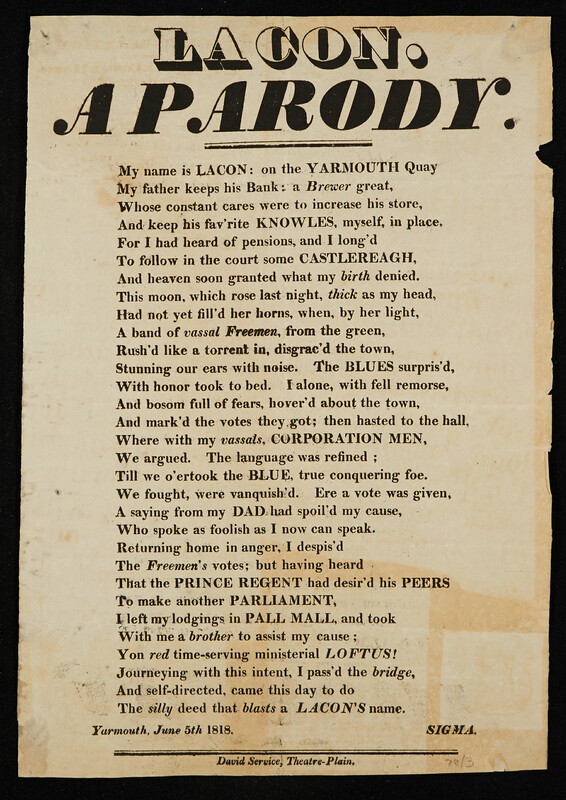 This “Reds’ Lament” mocks Thomas Campbell, with the L_C_N referring to Sir Edmund Lacon, who had unsuccessfully stood for the Tories at the 1826 General Election. This document dates to 1818 and relates to Sir Edmund Lacon’s involvement in the Lacon, Youll & Co. bank, which later became part of Lloyds Bank. He was also a brewer. Beer has recently started to be brewed again in Great Yarmouth as part of a relaunched Lacon’s Brewery. Lacon’s son, also called Sir Edmund, later became the MP for Great Yarmouth in 1852 when he sat alongside Charles Rumbold. 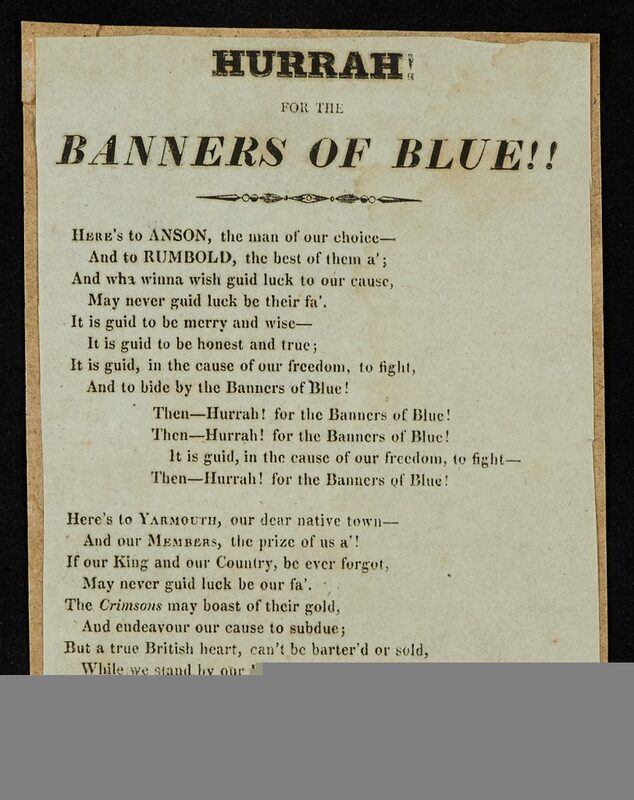 The ‘Banners of Blue’ campaign by the Tories tried to ensure that their candidates were seen as backing William IV with the ‘Hurrah for the Banners of Blue’ being a slogan used by numerous candidates throughout the country in 1830. It is another reminder that even in the 1830s it was important for candidates to ensure that they had a unified message for the electors.